Kentucky perfect season: Why the 1990–91 UNLV Runnin’ Rebels were more fun than this year’s Wildcats. Why UNLV’s nearly undefeated team was better than Kentucky. Larry Johnson and coach Jerry Tarkanian leave the court, with UNLV headed to the Final Four, during the 1990–91 season. I was obsessed with March Madness even before I fully understood basketball. During the 1982 final between Georgetown and North Carolina, I wondered why Patrick Ewing was left on the court after he picked up four quick goaltending violations—Wasn’t he on the verge of fouling out? my 9-year-old self asked. When my parents sent me to bed at halftime, I made a big stink. Mercifully, I was awake the next year when Dereck Whittenburg’s air ball magically turned into a Lorenzo Charles alley-oop that lifted the sixth-seeded N.C. State Wolfpack over Houston’s Phi Slama Jama, thus forever cementing my affection for the greatest time of the year. No basketball team has ever captured my heart, though, the way UNLV did during their nearly undefeated 1990–91 season. I was a rebellious teenager; they were the Runnin’ Rebels. Coach Jerry Tarkanian, who was mourned and celebrated in the most Vegas way possible after his death earlier this year, recruited players who were as exciting on the court as they were considered eligibility risks off it, and he thumbed his nose at the NCAA while doing so. Perhaps most important, UNLV had given us the gift of the most humiliating defeat Duke ever suffered the year before in the NCAA title game. The more the Kentucky Wildcats march, predictably and inexorably, toward a perfect season, the more I’ve been thinking about that thrilling UNLV team and what they almost accomplished. There are many surface similarities between the two teams. Three players from the Runnin’ Rebels were drafted in the top 12 after that season; Kentucky should match or exceed that total in this year’s NBA draft. Both spent the entire regular season at No. 1. They are also the last two teams to reach the Sweet 16 of the NCAA Tournament undefeated. * And like the late Tarkanian, UK coach John Calipari works under an ever-present cloud of suspicion, having left scandals in his wake at both UMass and Memphis. But more than these comparisons, what really has kept me thinking about how close UNLV came is my hope to see someone, anyone, defeat the Wildcats. I’m like the apocryphal veteran of the 1972 Miami Dolphins team who busts out the Champagne when the last unbeaten NFL team loses each season: If the Runnin’ Rebels didn’t go down in history with an undefeated record, I don’t want anyone else to. Especially Kentucky. There is much to be said for Calipari’s Wildcats. They are fast, and they are talented. Thanks in part to the surprising return of twins Andrew and Aaron Harrison for a second season after losing in the 2014 final, UK has unrivaled depth. There’s actually no reason to think they will lose. They are just so … boring. So businesslike. Kentucky’s roster is full of polished players who honed their games through years of AAU play and all the structure and refinement that comes with having the same elite athletes playing 100 games a year in front of the same coaches and recruiters. While Wildcats guard Tyler Ulis played for the MeanStreets AAU team out of Chicago as a teenager, players on UNLV’s roster grew up on actual mean streets. Larry Johnson got busted for stealing bikes and groceries as a 12-year-old in South Dallas. Anderson Hunt was from a tough neighborhood in Detroit. Elmore Spencer was on his third college when he got to UNLV. UNLV was also a better team than the Wildcats—or at least a more dominant one. The Rebels breezed through the regular season—handily defeating No. 2 Arkansas, the only team to lose to them by single digits—and rolled over their early NCAA Tournament foes. Looking back at the old score lines from that year is like seeing the men’s version of this year’s absurdly dominant women’s Huskies team. During the regular season, the average margin of victory was 29 points. Kentucky, meanwhile, had several close calls this year, including two overtime games and one two-point victory against mediocre conference opponents. Their average margin of victory during the regular season was 21 points, while scoring an average of a little more than 74 points per game and suffocating teams on defense. 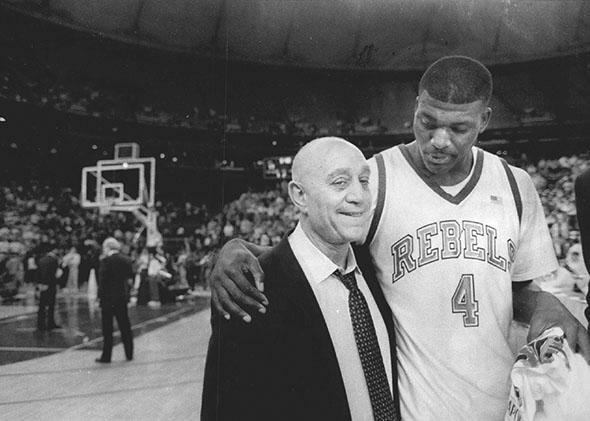 It’s also amazing to remember, as Jerry Tarkanian’s recent obits pointed out, that UNLV’s mere appearance in the tournament was the result of some unprecedentedly shrewd maneuvering with the NCAA. Kentucky haters like to complain that Calipari has stayed conveniently one step ahead of the law, and they have a point. But Tarkanian, for his part, didn’t play chess with the killjoys at the NCAA. He boxed them, and he won. Come tournament time, UNLV looked poised to make history, and I was ready for it. I had persuaded my very no-nonsense English teacher to let me write my senior research paper—a project that consumed much of the semester—on the history of the NCAA Tournament and how it had come to upstage the once-more-popular NIT. I envisioned a glorious conclusion to my work bolstered by the history-making finish that very year of UNLV completing the perfect title defense. If it had been possible to include audio clips in research papers back then, I would have cued up “One Shining Moment.” It was predestined. Only, of course, it wasn’t. In the Final Four, the unthinkable happened. UNLV met an improved Duke team, the refs called a completely bogus charging foul on Greg Anthony, Duke won 79–77, and my thesis was ruined. We will soon find out whether Kentucky leapfrogs that 1991 UNLV and matches the Hoosiers’ perfect season. But whatever happens during the rest of this year’s tournament, it can’t possibly be nearly as exciting as that memorable run.